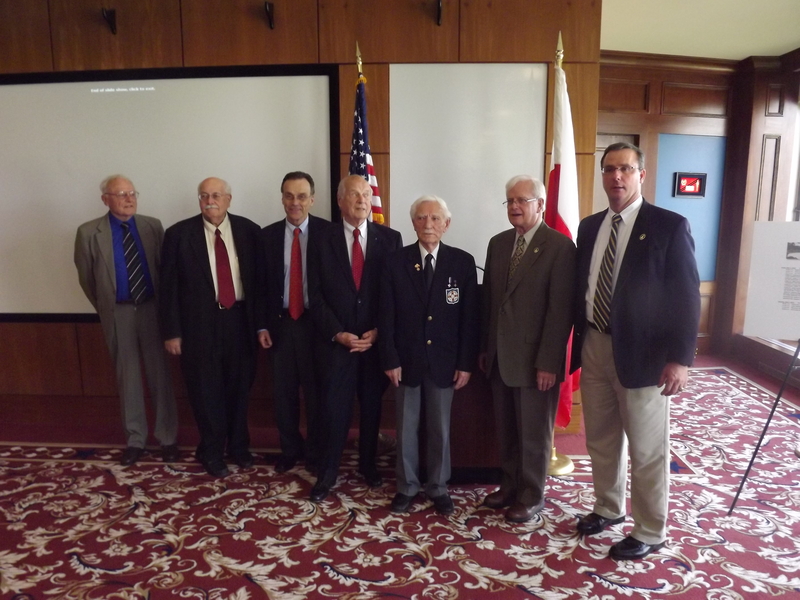 Under the theme, "FOR YOUR FREDOM AND OURS: Poland and Poles during World War II," it involved yet another cadre of distinguished panelists -- Mieczyslaw B. Biskupski, Wincenty Knapczyk, Julian Kulski, Andrew Nagorski, Michael A. Peszke, James S. Pula. All of the day's panelists -- save one, that being Professor Mieczyslaw B. Biskupski, Blejwas Professor of Polish and Polish American Studies at Central Connecticut State University -- are pictured below along with President Anthony J. Bajdek and Executive Vice President Stephen N. Olejasz. 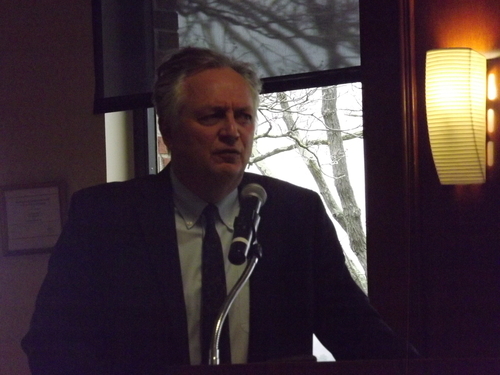 As fate would have it, two weeks following the Conference, Founding Vice President Michael A. Peszke, M.D., Professor Emeritus of the University of Connecticut School of Medicine and distinguished independent historian, passed away. From left to right the panelists pictured below had been Michael A. Peszke, James S. Pula, Andrew Nagorski, Julian Kulski, and Wincenty Knapczyk, along with Anthony J. Bajdek and Stephen N. Olejasz. As noted, Mieczyslaw B. Biskupski participated as a panelist but had been otherwise engaged when this photo had been taken. In his presentation, "Traces of My Life Story," Mr. Knapczyk (pictured below), a forced Polish exile to Siberia by Soviet Russia, then eventually a combat veteran of the 2nd Polish Corps of Monte Cassino fame during World War II, and today National Commander of the Polish Army Veterans Association (Stowarzyszenie Weteranow Armii Polskiej) of America, described how his life changed irreparably from the day as a teenager living in eastern Poland when World War II started on September 1, 1939 with Nazi Germany's invasion of Poland from the west which was followed on September 17, 1939 by the Soviet Russian invasion of Poland from the east. 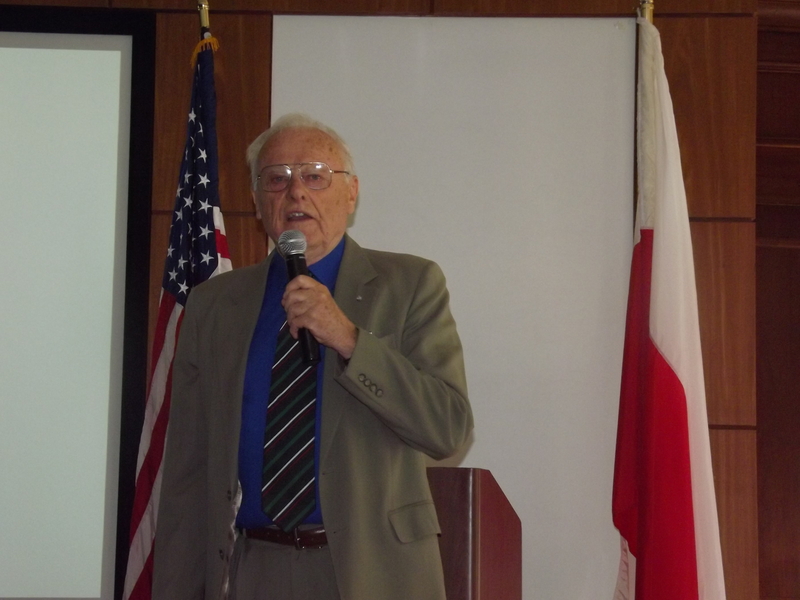 His presentation derived from his written autobiography -- "Traces of Fate: An Unexpected Journey" -- copyright 2015 -- relating the memorable story of his wartime experiences in Poland, Siberia, Iraq, Iran, Palestine, Italy, and England as a young Polish patriot and soldier. From Baranowicze, in the Nowogrodek region of eastern Poland, through exile in Siberia in 1940, through Krasnowodzk and the Caspian Sea to Iran, Iraq, then Palestine, Egypt, and Italy, and then to Nottingham, England and finally Trumbull, Connecticut, Wincenty Knapczyk described his personal odyssey worthy of the substance of the literature of classical Greece: "With a knock on the door, held at gunpoint by Russian soldiers, my family was ordered out of our home in a half hour and without regard to age, illness, or status. Our tortuous journey began. I was sixteen years old at the time...." Later, in harsh Siberian exile, "on my birthday, May 30, 1942, I was notified to join the army with a choice, Russian or Polish. I chose the Polish Army [under General Wladyslaw Anders which] in 1942 began evacuating 115,000 Polish citizens from this 'Soviet Paradise' by ship across the Caspian Sea to Iran. This included about 70,000 Polish soldiers, more than 25,000 military families, including my family, approximately 10,000 youth cadets, boys and girls, children and orphans.... From Iran, soldiers were deployed to Iraq and Palestine.... I was in the 10th Heavy Artillery Regiment of the 2nd Polish Corps [which was] deployed to the front lines on January 31, 1944 first in the action in the region of Compobasso on a front stretching along the river Sangro, then from April 24, 1944, the 2nd Polish Corps started preparing for taking over the task of defeating German forces at Monte Cassino." Afer the War, the entire Polish 2nd Corps was transported to England. It was there that he met a young Polish woman , Helena Kubowicz, with a "Siberian story" similar to his own, whom he married in Nottingham on December 26, 1948. Their long journey finally ended when they settled in Trumbull, Connecticut. 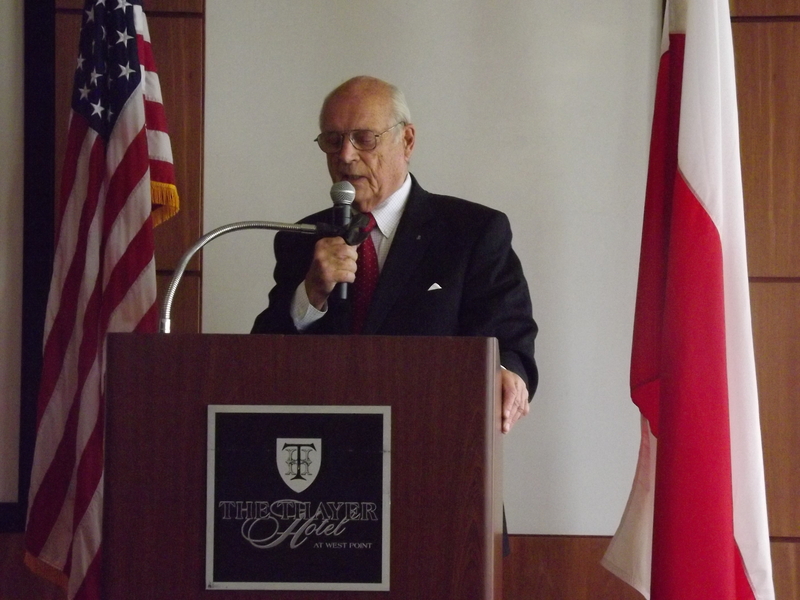 On his part, Professor Kulski related his own amazing personal story of being a boy, teenager and resident of Warsaw during World War II via remarks that paralleled his autobiography, "The Color of Courage: the World War II Diary of Julian Kulski" (copyright s 1979, 2014 by Julian E. Kulski and 2014 by Aquila Polonica U.S. Ltd.). He arranged his experiences by age-related chapters as follows: Chapter 1 (1939, age 10: The War Begins); Chapter 2 (1940, age 11: My Own Private War Against the Germans); Chapter 3 (1941, age 12: Recruited into the Underground Army); Chapter 4 (1942, age 13: Secret Mission into the Ghetto); Chapter 5 (1943, age 14: Ghetto Uprising; Caught by the Gestapo); Chapter 6 (1944, age 15: The Warsaw Uprising); and Chapter 7 (1945, age 16: German POW; Escape to Freedom), all of which were then also presented in a related DVD film production, "Legacy of the White Eagle: A True Story of Teenagers Fighting for Freedom and Independence" -- copyright 2006. 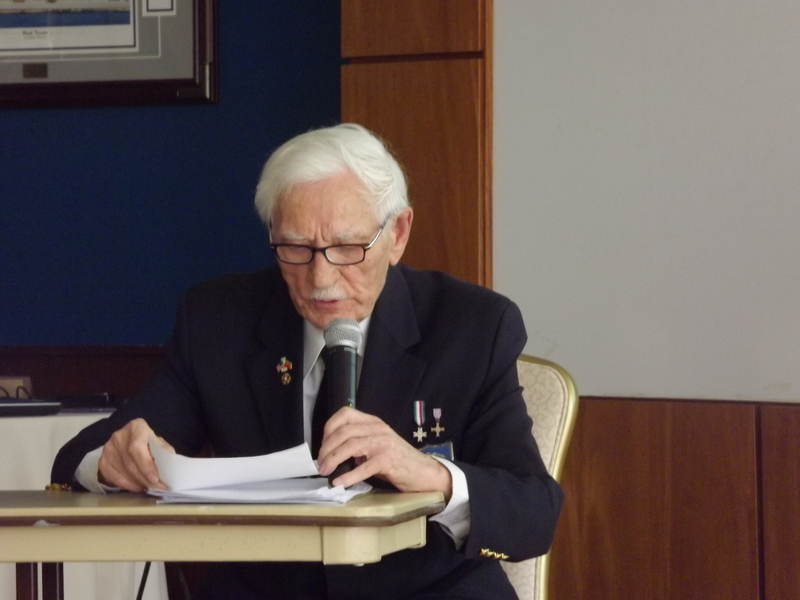 A veteran combatant of the Underground Army's 9th Company Commandos and lifelong Polish patriot, he dedicated his autobiography to his comrades-in arms, and composed a brief lyrical statement about it: "What is the color of courage? Red, of course. Because courage in wartime means risking your lifeblood. Our flag is red and white. I think of this -- red for courage, white for honor. After all, what does a man have in the end, except his honor...and the courage to live by it?" It had been clear to all of those in attendance that Julian Kulski was above all an exemplar of honor. 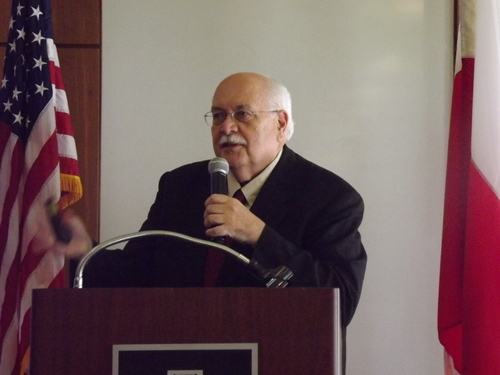 After arriving in the United States, Julian Kulski earned his B. Arch. and M. Arch. degrees form Yale University in 1953 and 1956 respectively, and his Ph.D. in Urban Planning from the Warsaw Institute of Techniology in 1956. Proffessionally, he went on to lead the Urban and Regional Planning Program at the University of Notre Dame, later established the first City Planning Program at George Washington University, and then similarly established the first City Planning Program at Howard University. The driving force behind Michael A. Peszke's avocation for studying and writing about Poland's history during World War II was best identified in one of the books he authored, "The Polish Underground Army, the Western Allies, and the Failure of Strategic Unity in World War II," when he wrote as its dedication, "To my father, Lt. Col. Alfred Peszke, Polish Air Force, whose life was dedicated to a free Poland and whose love was lavished on his family; and my mother, Eugenia Halina Grebocka Peszke, who took care of me throughout the turbulent years of the Second World War." Lt. Col. Alfred Peszke had been in 1944 the Chief of Polish Air Force planning for Poland's Government in Exile located in London, England. For the Conference, Dr. Peszke's illustrated presentation focused on dispelling three unfounded myths about Poland's combat participation in World War II, those being that: (1) "Poles were caught 'napping' analogous to the Americans at Pearl Harbor", (2) "Poles fielded a cavalry army", and (3) "After September 1939 and the occupation and partition of Poland by the Germans and Soviets, the myth would have it that Poles flocked as 'volunteers' to the British Army". Over the years of our Association's Annual Kosciuszko Conferences, Professor Jim Pula has proven himself to be the unchallenged master of power-point presentations, especially so with regard to including battle-field animation of troop movements in combat theatres of operation in America and in Poland during Kosciuszko's lifetime, and for our 2015 Conference, fighter plane combat in the air during World War I and World War II which had been provided under the title, "For Your Freedom and Ours: The Kosciuszko Squadron, 1919 - 1945." In a stunning array of carefully created slides, one of which included the original signed copy of a letter dated April 29, 1919 to Poland's leader, General Jozef Pilsudski (1867-1935), from Marian C. Cooper (1893-1973), Florida-born bomber pilot in the Air Service of the United States Army during World War I, in which Cooper volunteered to serve as a fighter pilot in Poland's Kosciuszko Squadron (Eskadra Lotnicza im. Kosciuszki) during the Polish-Bolshevik War of 1919-1921 against communist Russia. [In later life, Cooper had been an anti-communist Hollywood producer and film director, and a suppoter of the efforts of U. S. Senator Joe McCarthy of Wisconsin to identify and root out Cold War communists and their clearly un-American activities in Hollywood, Washington DC, and other places in the United States during the late 1940s and 1950s.] In 1919-1921, Poland's Kosciuszko Squadron, of which Cooper had been a member along with other American volunteers who mastered flying Poland's Albatross D.111 fighter planes, had caused the Commander of Poland's 3rd Army, General Antoni Lisowski, to state tersely that "without the American pilots' help, we would long ago have been done for." During World War II, the Kosciuszko Squadron's fame became manifest once again during the period known as the Battle of Britain when Polish pilots in 1940 quickly had to learn the difference in flying British fighters where to open the throttle one had to pull out the lever rather than push it in; remember that air speed was in miles, not kilometers and that the altimeter was in feet, not meters; cockpits were closed, not open; and parachute toggles were on the opposite side from those in Poland; among other differences, language included. From a German Messerschmitt-109 at an airspeed of 359 mph with one 20mm cannon and four 7.9mm machine guns compared to a British Spitfire at an airspeed of 362 mph with eight 7.7mm machine guns; and a German Messerschmitt-110 at an airspeed of 342 mph, with two 20mm cannons and five 7.9mm machineguns compared to a British Hurricane at an airspeed of 324 mph with eight 7.7mm machine guns, for example, Professor Jim Pula artfully threw in everything one would have to know for a very clear understanding of the basis of the 303rd Kosciuszko Squadron's incomparable "winning score" of airkills -- destroyed, probable, and damaged -- during World War II, achieved by exceptionally-superior, courageous, and patriotic Polish pilots who had truly mastered the art and science of combat flying in keeping with their Kosciuszko Squadron predecessors in 1919-1921. 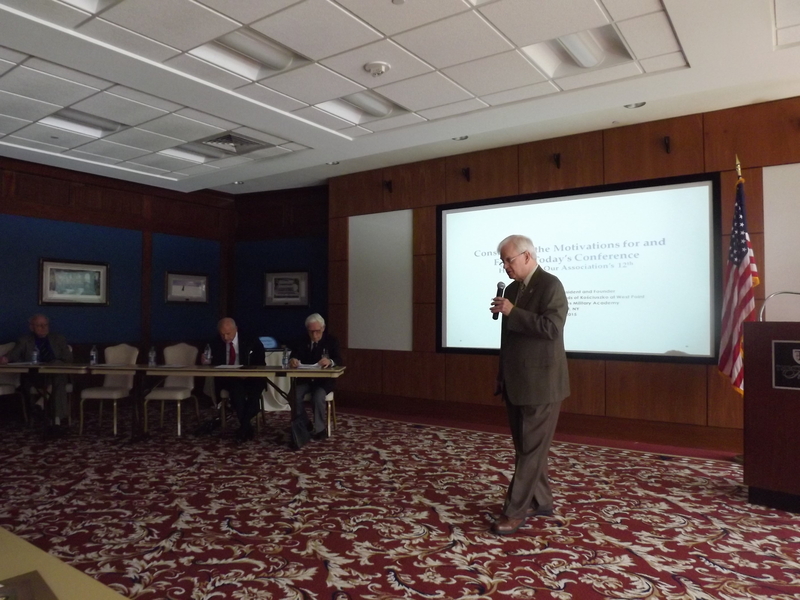 In his presentation, Professor Biskupski included a highly-enlightening discussion on a topic unknown to the vast majority of Americans, historians included. Whereas informed Americans of Polish descent, generally at least, understand the catastrophic implications on Poland of the agreements reached by Franklin Roosevelt of the United States, Winston Churchill of Great Britain, and Joseph Stalin of the Soviet Union at the Tehran and Yalta Conferences during World War II, they may not have known the extent to which the Roosevelt administration purposefully accommodated the Soviet Union's plan to defame, denigrate, and destroy the image of Poland, Poles, and Polish Americans among the general public of the United States by way of influencing script writing for Hollywood motion picture productions during that War. Therefore, all such accommodations had been by the Roosevelt administration in the name of preserving Allied unity, of which Poland had been an integral part, in the face of the Nazi German threat to the "free world" and Western Civilization, based on a no questions asked American policy vis-a-vis the Soviet Union. Thanks to Professor Biskupski's much-needed pioneering, meticulously-documented work, "Hollywood's War with Poland, 1939 - 1945" -- copyright 2010 by The University Press of Kentucky -- the painful story of the impact on Poland of wartime Hollywood's radical "leftist" and pro-Soviet Union screen writers, directors, and producers who held that Stalin and the Soviet Union were "sacrosanct" subjects, is now known. Indeed, America's Office of War Information (OWI) facilatated a procedural atmosphere whereby Hollywood screen writers were expected to submit their proposed Russian and Polish-related scripts to the Soviet Embassy in Washington, DC for approval, recommendations for modification, or rejection. The practical results, therefore, understandably had been predictable. Whether as Allied combatants in Europe or as Americans of Polish descent in the United states, Poles uniformly were portrayed as cowardly, unreliable, frivolous, and treacherous. As an Allied nation, therefore, Poland's cause during World War II merited no more than polite disinterest on the part of the Roosevelt administration and concomitantly, the White House's acceptance of it being a veritable "cost-of-doing business" nuisance threatening unified Allied victory led by the charismatic "Big Three" Allies in Washingtom, London, and Moscow. 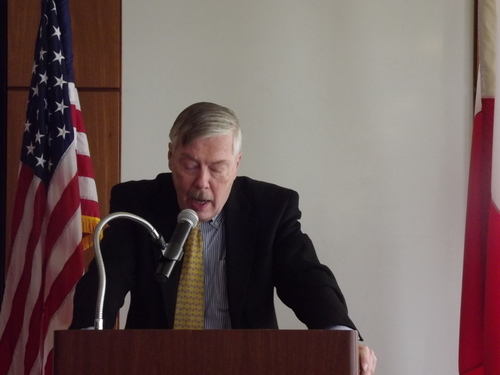 Mr. Nagorski gave a presentation on the life of Jan Karski on behalf of the Jan Karski Educational Foundation. 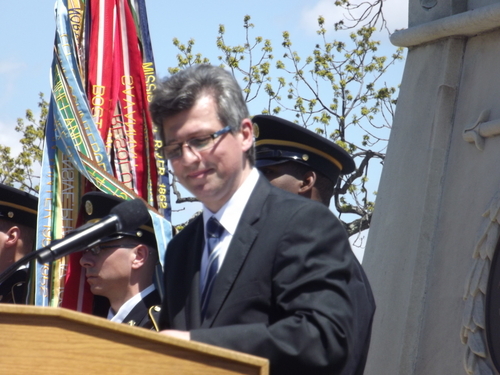 Colonel Olejasz closed the Conference and invited all to participate in the 13th Annual Kosciuszko Conference at West Point on April 29, 2016 and the Association's "Kosciuszko Day" commemorations on April 30. 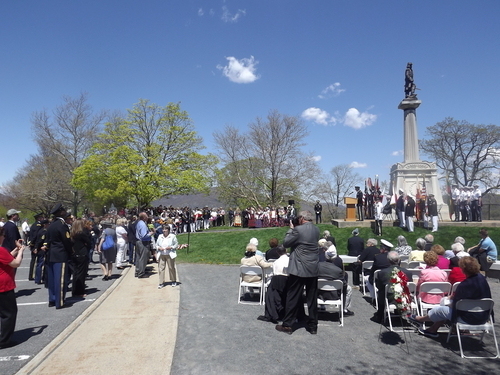 May 2, 2015 proved to be this year's annual version of yet another beautiful spring day for celebrating, in this case, the 187th anniversary year of the first Kosciuszko observance at West Point that occurred on July 4, 1828. 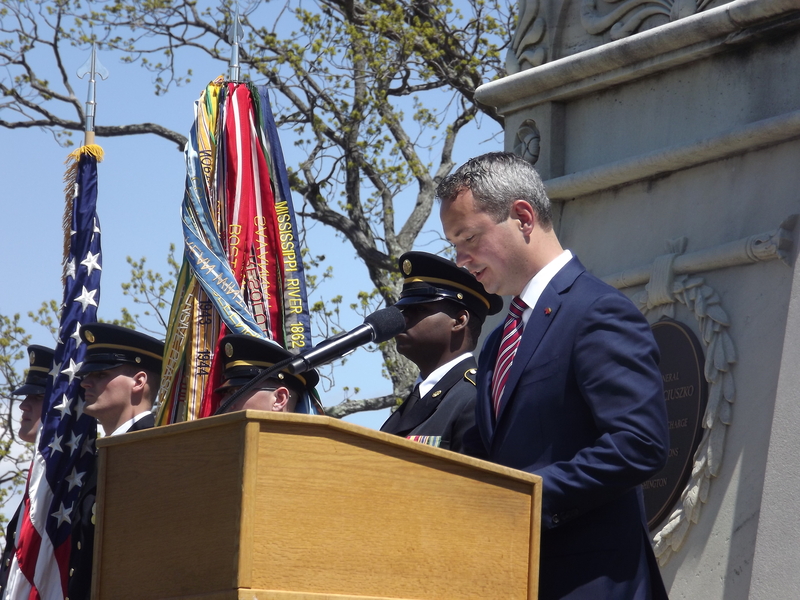 This annual marquee event at West Point brings together Polish American scouting groups, fraternal and veterans' organizations, as well as the senior leadership of the United States Military Academy. This annual commemoration at the Kosciuszko Monument continues to be a singular event at West Point which attracts Polish American scouting groups, fraternal and veterans' organizations, as well as the senior leadership of th United States Military Academy. Piotr Konowrocki, Chief of Consular Services for the Polish Embassy in Washington, DC spoke about the importance of the NATO-based alliance between the United States, Poland, and Lithuania in today's dangerous world. Julius Pranevicius, Consul General, in New York City, NY spoke about the importance of the NATO-based alliance between the United States, Lithuania, and Poland in today's dangerous world. 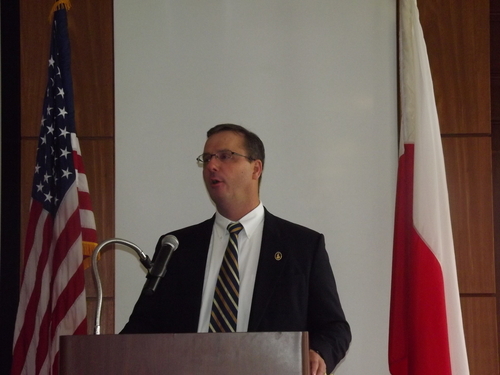 Although the 21st century relationship of Poland and Lithuania differs significantly from what it had been prior to and during the Partitions of the Commonwealth of Poland and Lithuania in the late 18th century, the inclusion of members of their diplomatic corps serving in the United States in our Association's annual Kosciuszko program at West Point is firmly based in keeping with the spirit of Kosciuszko's own related words: "Do not differentiate among the sons of Poland, whether they speak in the Ruthenian, Polish, or Lithuanian tongues, or whatever their religion, if they act together with you, and declare themselves in the name of the people, go forward with them, as with brothers." Before the warm days of summer 2015 were about to come to an end, we learned sadly of the passing of Honorary Board Member Edward J. Kaplita of Chicopee, MA -- loyal colleague, friend, and benefactor (see the "In Memoriam" section of our website).